The research available on the use of positive risk-taking in clinical practice is surprisingly limited. 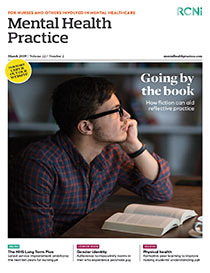 The purpose of this article is to highlight the limitations and make recommendations about how risk-taking could shape future practice in mental health services. A search of databases including CINAHL and PsycINFO for papers that included the keywords recovery, risk management, positive risk-taking and risk management found that mental health practitioners were keen to promote positive risk-taking with patients to enable their recovery. Barriers to this included a culture of blame should a negative outcome arise, and the need for more support and guidance from management. As positive risk-taking has been shown to be an important part of successful recovery, there is a need for more research to support its application in clinical practice.